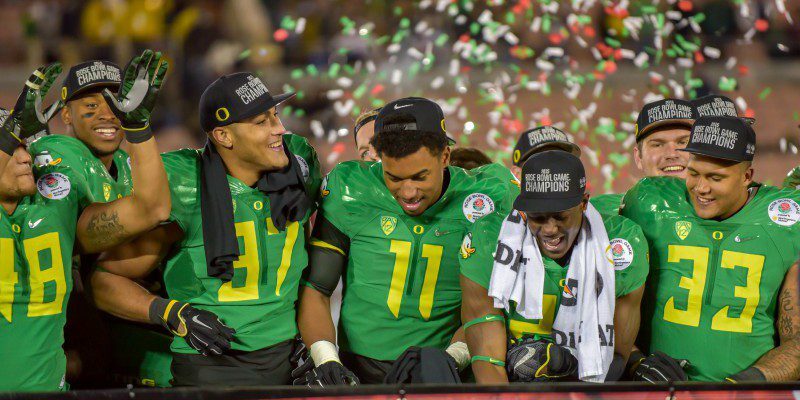 In the wake of Oregon’s loss to Ohio State in the national championship game, it is perhaps inevitable that we stop and assess the state of Duck football: both how far we’ve come and what it takes to make that final step. One senses two disparate facts: that Oregon has cemented itself as one of the premier programs in college football, but also that we may still lack enough across-the-board talent to go all the way. 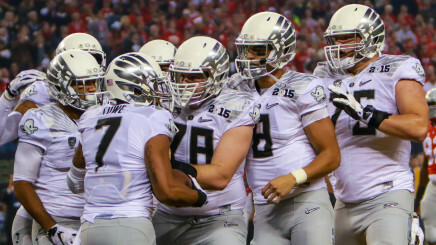 Maybe the Ducks came up more than three touchdowns short in the final grim calculus of the title game. And there’s no maybe about what a bitter pill that was to swallow. But, consider this: for Oregon to win even one national championship would arguably be a greater achievement than Ohio State or Alabama or USC winning 10. These teams perennially at the top, with trophy cases full of national titles, have one thing in common: not great coaches or enough fans to fill hundred-thousand-seat stadiums, but a constant waterfall of great recruits in their backyards. Keanon Lowe (No. 7) and team mates during the championship game. Even with all the success Oregon has had as the winningest team in college football since 2010, the team has never been able to consistently stock its roster with many four and five-star players, which are practically a dime a dozen to the iconic programs. If you go by the recruiting services, we’re winning more than 10 games each season with a lot of three-star guys. It’s not that the ratings aren’t wrong sometimes: Marcus Mariota got three stars coming out of high school from recruiting service Scout.com. And it’s not to say we don’t get some blue-chippers. Players from this year’s team such as Thomas Tyner, Arik Armstead, DeForest Buckner, Byron Marshall, Royce Freeman, Devon Allen, Pharaoh Brown and Darren Carrington (among others) got four or five stars. But particularly on the line of scrimmage, we have lacked top talent, or at least depth. As a result, we’ve had to innovate, and maybe even use a little smoke and mirrors, to even approach that level of play. Yet here the Ducks are, playing at the highest level of college football, and there’s no reason that can’t continue. There’s no reason it’s not part of the process. Oregon lost the title, but it’s worth noting there are many teams and players in every sport that had to hang around at the championship level for years and amidst many failed efforts before they finally broke through. Achievements such as a Heisman Trophy and a runaway Rose Bowl title are, like that premier winning record for this decade, tent poles for the Oregon program that speak to the excellence happening in Eugene. The longer you hang around near the mountaintop, the greater the chances of finally planting that flag. Maybe the title we seek is just a year or a few years away, or maybe we never will win it all. But that’s not the only measure of success. We’ve already shown more innovation and creativity and moxie than those Old Guard teams ever will know. And the nation has noticed. 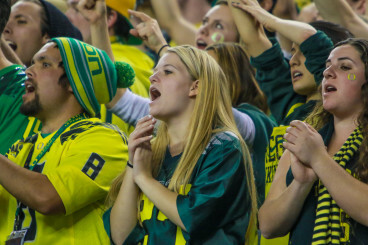 Particularly to millions of young college football fans around the nation, who have grown up with the Ducks competing for the sport’s highest honors, Oregon is as popular as any in the sport. The team represents speed, innovation and style. Like the great Steve Prefontaine did for Oregon, the Ducks football program has shown us all that the greatest players and teams, those that most inspire and endure in our memories, are not always those who took the trophies and medals. We may still win that title, but we’ve already accomplished something nearly as special. And if it so happens that we do win it all one day, it will be provide Oregon and its fans a euphoria that supporters of the Crimson Tide and Buckeyes, Fighting Irish and Seminoles, for all their combined championships, may have never truly known. We’ve got to win a title the hard way, harder than the path of those teams, but when we do it will be more special than even the most memorable championships of the past.